Founded as the Hospital de San Carlos in the 18th century, the building now takes its name from Francisco Sabatini (Palermo, Italy, 1722 – Madrid, 1797), the architect in charge of its construction. The hospital was founded at the initiative of King Carlos III of Spain, as part of a series of measures to give Madrid the infrastructure necessary for adequate hygiene and urban order. After an initial building phase under the direction of the architect José de Hermosilla (Llerena, Badajoz, 1715 – Madrid, 1776), Sabatini, from the Bourbon court of Naples, completed it, using a sombre neoclassical style that found its inspiration in the Late Renaissance. Although the monarch's death in 1788 meant the building was left unfinished, it began to function as a hospital shortly thereafter, and continued to do so until 1965. Then, after some years of abandonment and various threats of demolition, the Spanish government declared it a Historical-Artistic Monument in 1977, which ensured its preservation and public use. In 1980, Antonio Fernández Alba (Salamanca, 1927) remodelled the building to make it suitable for exhibitions. In 1986 it started to host temporary exhibitions as an art centre, to be transformed a few years later, in 1990, into the museum it is today. These modifications took advantage of the unfinished elements of the hospital: the outdoor space meant to be a second courtyard became a public square that gives the museum visibility and connects it with Calle Atocha; the missing façade was filled with two monumental towers in steel and glass, which hold the exterior lifts that facilitate visitor circulation. Built by the Rationalist architects José Luis Íñiguez de Onzoño (Bilbao, 1927) and Antonio Vázquez de Castro (Madrid, 1929) in collaboration with the British architect Ian Ritchie (Sussex, England, 1947), these towers have become one of the Museum's most well-known features. The interior is arranged around a courtyard with broad vaulted galleries supported by stone pilasters and exhibition spaces that open toward the exterior and also toward the courtyard, thus providing natural lighting. The building also has alternative spaces, such as the brick vaulted cellars and the protocol room, which is where the former hospital stored its linen and still contains its original furnishings, now used for exhibition purposes. An international call for projects for an extension to the Museum was issued in 1999, with designs being received from architects such as Juan Navarro Baldeweg, Dominique Perrault, Zaha Hadid, Enric Miralles and Tadao Ando, among others. In 2001 construction began on the winning submission, by the architect Jean Nouvel (Fumel, France, 1945). From the very beginning, the building was considered to be, in the words of its creator, the shadow of Reina Sofía, in other words, it is at the service of the Sabatini Building, whose functions it expands upon and completes without interfering with the central role played by the original site. The Nouvel Building complex was inaugurated in June of 2005. It comprises two expansive exhibition spaces, a library and documentation centre, bookshop, offices, café-restaurant, a protocol room and two auditoriums with seating capacity of 200 and 400, respectively. The extension adapts to the south-west façade of the Sabatini Building and the triangle-shaped plot in front of it. In it, Nouvel respected the placement of three pre-existing buildings for the construction of three new modules. Although free-standing they are connected to one other and to the Sabatini Building on various levels: by large overhanging eaves that form a canopy extending to the hospital's cornice and reflect the movement of the city below in convex aluminium forms lacquered in red; by elevated walkways joining the buildings; and by a semi-public square that engages in a dialogue with the urban surroundings. 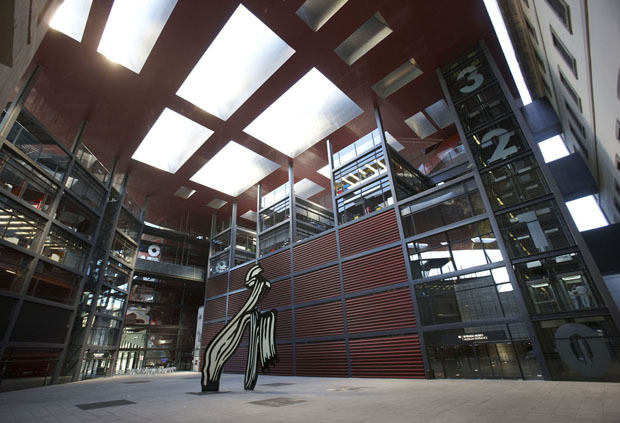 The square serves as a connecting element for various parts of the city (Atocha Station, Calle Atocha, the Lavapiés neighbourhood), while evoking the Sabatini courtyard as an intimate, yet diaphanous space. Since its inauguration, visitor flow has a more plural structure, since the new building provides an alternative entrance and there are various connections between the Sabatini galleries and the new spaces by Nouvel. This arrangement creates a number of potential itineraries and enables a clearer distinction to be made between service areas and exhibition space. 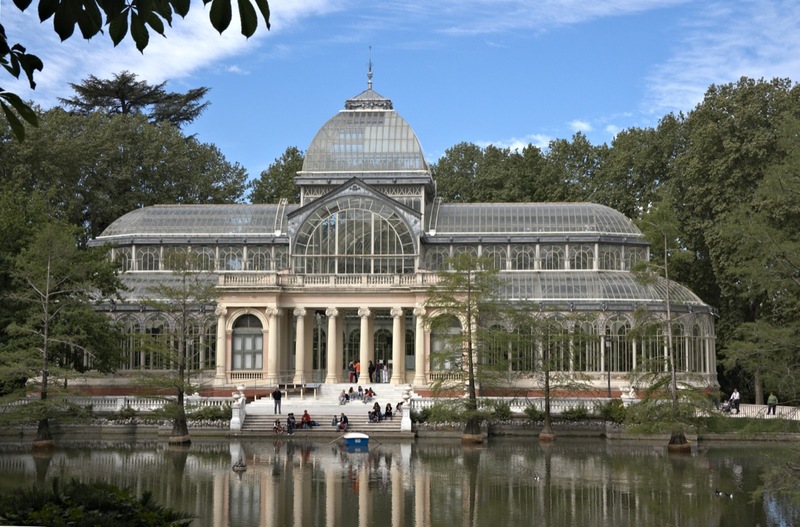 The Palacio de Cristal [Crystal Palace] is one of the two exhibition venues that the Museo Nacional Centro de Arte Reina Sofía runs in Madrid’s largest city park, Parque de El Retiro. The building was conceived as a greenhouse for the Plants of the Philippines Exhibition (1887), organized at a time when the Philippine Islands were still a Spanish colony. The Palace’s design, by the Spanish architect Ricardo Velázquez Bosco, bears witness both to an innovate use of materials such as iron and glass, and to the history of 19th century colonialism. The cast iron columns of the building, combined with large areas of glass and an unobstructed floor plan, create a monumental effect and were, at the time, very innovative, and intended to produce in viewers an impression of phantasy and unreal spaces. 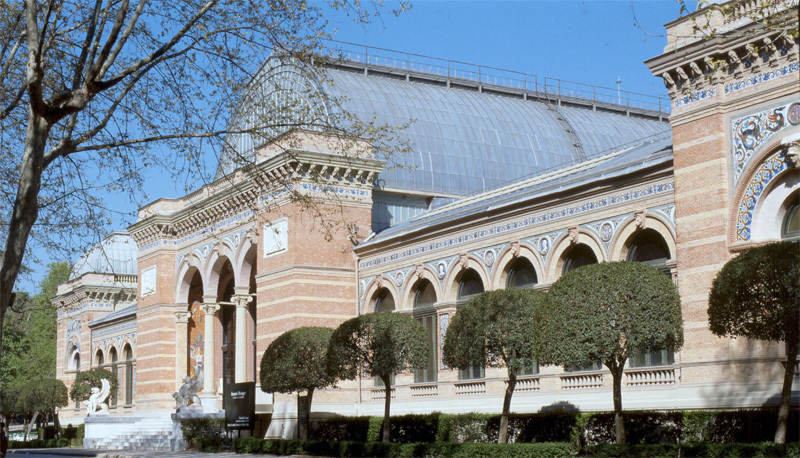 After the Plants of the Philippines Exhibition, during a time the Palacio de Cristal regularly hosted the National Fine Arts Exhibitions. Since 1990, houses site-specific projects and installations by contemporary artists. Palacio de Velázquez (1883) is, along with Palacio de Cristal, one of the two exhibition areas that Museo Reina Sofía has in Parque del Buen Retiro in Madrid. It takes its name from the architect Ricardo Velázquez Bosco, who was responsible for its construction, along with the ceramicist Daniel Zuloaga and the engineer Alberto del Palacio. The building, in the realm of Neo-renaissance historicism, has a spacious floor plan, vaulted ceilings with iron structures and natural lighting, thanks to a large area of glass. Conceived as the main pavilion for the International Exposition of Mining, Metal Arts, Ceramics, Glasswork and Mineral Waters of 1883, it follows the model used by Joseph Paxton for the Crystal Palace of London, built in 1851. 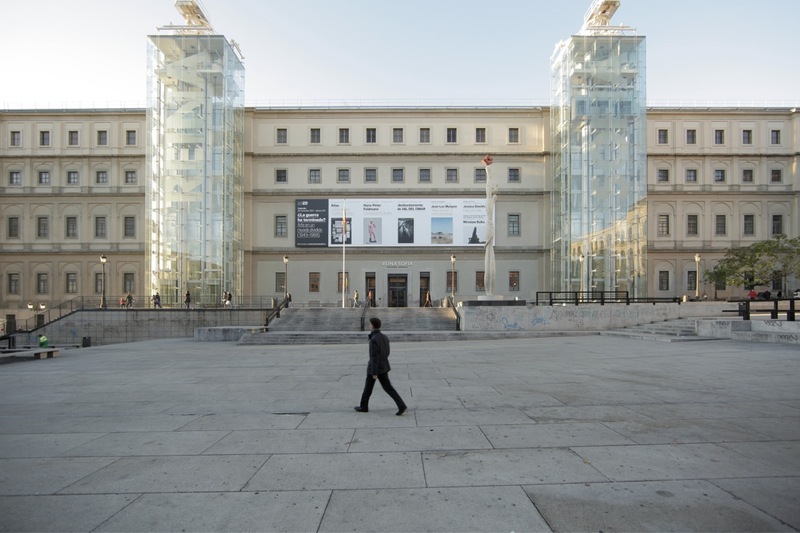 Since 1987 it has provided a venue for monographic exhibitions by artists such as Cindy Sherman, Nan Goldin, Juan Muñoz and José Manuel Broto, and others. It was closed for renovations in 2005 and opened in 2010 with a retrospective on Miralda, captured in these pictures.